This adaptation of Julia Donaldson's book returns for a Christmas run in 2015. This wonderfully exuberant and imaginative production is based on Julia Donaldson’s book of the same name and tells the story of Stick Man, who becomes swept up in a colourful adventure that takes him far away from his stick family and their home in the family tree. The trio of actors (from Scamp theatre company) are endlessly inventive, employing everything from umbrellas (opened and twirling to convey the ocean) to balletic dance routines involving beach rubber rings to keep the story rolling. 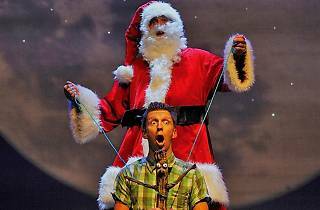 Folksy, foot-tapping music, large doses of humour (‘What does a well-dressed stick man wear? Vivienne Westwood.’), and a hilarious torch-song set piece involving a Stick Man version of Baker Street, will keep older children and parents grinning too. There are some nice seasonal touches too, including plenty of pantomime-style audience interaction, as well as an appropriately jolly Santa. Our three-year-old critic was engrossed from start to finish. One piece of advice: for toddlers, pick up a booster seat (available at the side of the auditorium) as the seating is not stacked. Ages 3+. Our three year old was transfixed throughout, as was I. Such an imaginative adaptation and clever use of props, brought to life by such fabulous actors. Cannot recommend highly enough. Go! I've just watched the play with my 3 years old daughter. She can easily get bored that kind of things but this time she enjoyed and focus on stage until the end of 55 minutes! Highly recommended.. Absolutely recommended!! We were visiting London and saw the poster somewhere. Stick Man, one of our favorite books by Julia Donaldson was on stage. Perfect for our 3-year old. It lasts 55 minutes, the music is great and the actors very lively. How did he enjoy it!! As one of our favourite authors, I have taken my children to see adaptations of Julia Donaldson's The Gruffalo, The Snail and the Whale and Room on the Broom. Stick Man, which we saw last year, or was it the year before, is hands down the best production. I would recommend this whole-heatedly, for the whole family. Brilliant and quite unforgettable. We took our two-year old to this play last year, just prior to his second birthday. He LOVED it. It was so well done... just amazing. He was transfixed for the entire play. It was amusing, with great songs and great, exceedingly animated actors. A few in-jokes thrown in for the adults. Also, and this is important for toddler plays, not too long.